I’m a size 10 in both the OG Vics and OG Vic XC’s. The XC’s are a tad bit more snug but I think that’s probably due to the extra arch support. If the Vics are real snug you might want to think about going up to the 9.5. My size 9 OG Vics fit on the limit with no socks so you would suggest a 9? 8.5 sounds too small for me. Does anyone else have an opinion/recommendation on this? Anyone know how the Women’s Terra Kiger fits comparable to other Men’s Nike shoes? Trying to decide if I can get away with buying the Women’s version. You’d have to go up at least a size and a half. Women’s shoes are also made in B width while men’s are made in D. So if you have a slightly wider foot you might even want to go 2 sizes up. I know this is ten days late, but I would not size down with Vic Elite/2 / Tumbo 2. The OG Tumbos and Vics already fit pretty big (i.e. 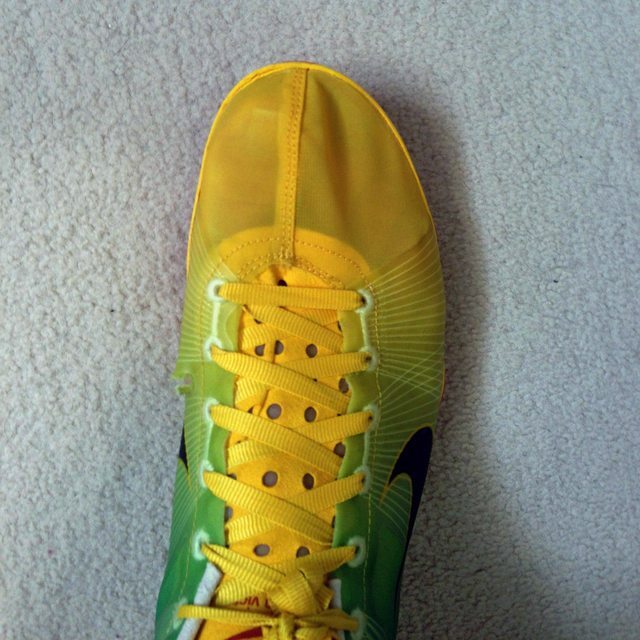 sizing down) so I would not risk sizing down with the new line of spikes. For example, I can wear a snug 7 in Tumbos and Vics. That’s seriously tiny, some flats in 7.5 are too small for me which shows how big the tumbos/vics are (sockless). So… I wouldn’t size down. PS from the picture, looks perfect. I wear a 11 in Saucony Fastwitches and a 10.5 in adizero Tempos. Should i then get adidas spikes in 10.5 as well? I wear a 11 in matumbos with a little wiggle room if that helps. What size should I get for Universe 4? Size 10. I’m a 10 in Structures and Pegasus, but I got a 9.5 in Victory 2’s for a really snug fit, normally wear it barefoot. Not really gonna add much to this thread, but the brooks mach series has significantly improved and are now some of the best cross spikes out there. Not worth throwing away if they still have some life left. Wanting to buy the matumbo 2 for spring 5ks, but they sold out of the 11.5’s on FTTF before i jumped on them. 11.5 2E typically in all other, non nike trainers. Basically, I’m wondering if people are sizing up on the matumbo 2’s and if a 12 would be better than a 11.5? I’m going to kind of piggyback off of cchstrack’s post since we have the same question but wear different shoes/spikes so I might not get a firm idea based off a recommendation for him. I’ve heard, contrary to cchstrack, that people go a half size down from the OG tumbos when wearing tumbo 2’s. That would put me at the 9.5 range? Also, since 10’s are a little loose when I go sockless, would a half size down (10 down to 9.5 for the OG’s) make them perfect sockless and thus make my tumbo 2’s really a size 9?!? I wear a size 9 for Nike OG vics, what would my Adidas Cadence 2 size be? Thanks!